M. and I were eating breakfast on our tiny back deck on Monday—it was the first sunny day in a week—when I saw some little bird flitting around. 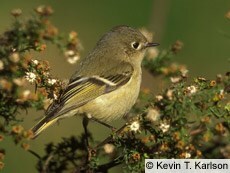 So I got a field guide and started paging through it until the answer came: ruby-crowned kinglets. Oh yeah, them. Migrating through? Nesting here? "Often hover at branch tips to glean tiny insects," says The Sibley Field Guide of Birds of Western North America. The Colorado Breeding Bird Atlas has them nesting in conifers at medium to high elevations. But they are loud for their size. I thought that song had to be coming from some bigger bird. 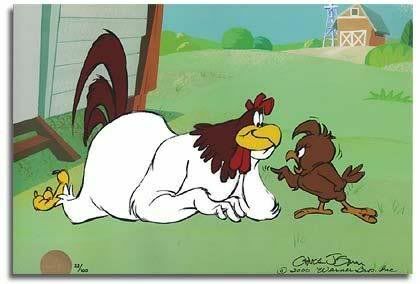 Reminds me of the Warner Brothers chicken hawk.